"Winter is coming. So keep yourself warm with these new designs. I am using new Yarn to increase the quality of my products, just for you. New technology is being used for my '2-sided knitting' designs. 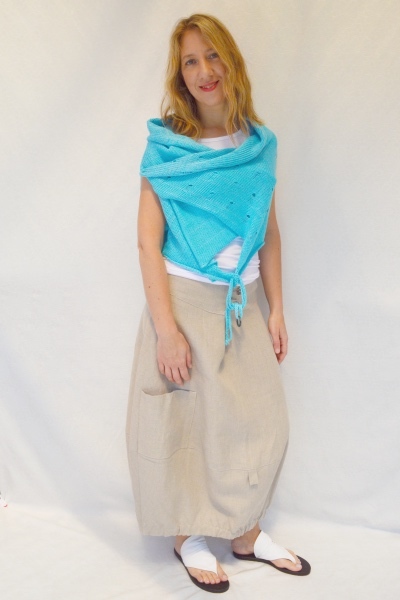 One side is made with kid mohair while the other side is made with cotton, which instead of being itchy, is pleasant to wear close to your skin." It is infinitely wearable, both for special occasions or for everyday life. In no situation will you find anyone who is more stylish than you! It looks great with leggings, jeans, or classic pants. - Washable and dry-able in wash machine. This Mohair Vest is light, warm, and inviting to touch. It’s so comfy, you will wear it day-to-night! Looks so good with any kind of pants and belts! - Cotton and kid mohair blend. - Lay it flat to dry. Winter Scarf is designed for ladies who like to wrap themselves and who appreciate the comforting feeling of a gentle hug. I designed a new version of Summer Jacket. This upgraded version keeps all advantages of the previous generations, such as an elegant and natural shape, a soft and comfortable feel, and (not the least) an economic price. As all Jackets, LiLi Jacket can be worn in a number of different ways. So, you are not buying just one jacket! 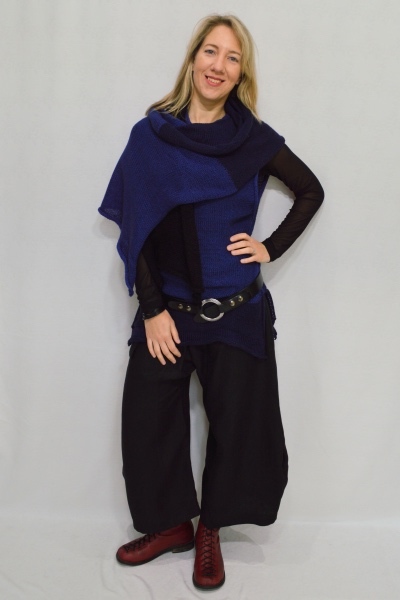 Go maxi this Fall with my new skirt designed from linen fabric. Soft folds on the skirt create a charming and feminine look. This skirt can be easily combined with any of my knitted tops and your favorite boots. "There is nothing more comfortable on a hot summer day than a linen dress! This Stripe Dress is made of thin linen. Its silhouette is an interplay between the design and different directions of the stripes." 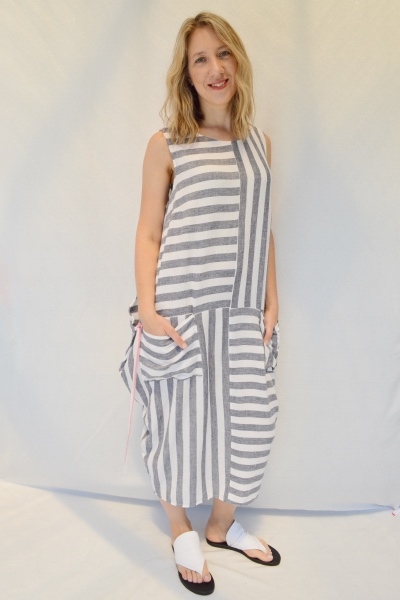 This Stripe Dress is made of thin linen. Its silhouette is an interplay between the design and different directions of the stripes. Linen is the best material for summer. It is light, comfortable, and chic. It requires little care and no ironing at all. It's the perfect choice to give an extra edge to your summer look. - Please wash gently and lay flat to dry. As all Summer Jackets, this Summer Jacket can be worn in a number of different ways. So, you are not buying just one jacket! Wrap is designed for ladies who like to wrap themselves and who appreciate the comforting feeling of a gentle hug. The main feature of the Wrap is its soft flexible texture created by a web of delicate loops. "Its unique design makes it fit perfectly any body shape. It is made from boiled wool. The characteristic feature of this material is that it stretches equally well any direction. It is also light and warm. It will keep you pleasantly comfortable indoors and outdoors. And of course, its stylish decoration will keep everybody’s eyes on you!" Light and Warm unique wool jacket keeps you warm in winter time. Let wear loose Polkadot dress with any leggings and skinny pants. This vest has an fashionable asymmetric design. It is light, warm and comfortable. It looks great with leggings, jeans, or classic pants. This is a loosely fitting sweater which is hip-long and is often worn over leggings or pants. It is a one of-a-kind lacy knit that will transform your silhouette. - Washing temperature - 30C. - Don't use too much detergent. - Wash with inside out. - Don't let the garment soak. - Don't use fabric softener. This long, fluid dress with two pockets is an autumnal version of the bestseller of the Spring 2016 Collection. If you don’t want to part with your Summer Dress, you can now have he same dress with long sleeves and in color combination and continue to enjoy the comfort of its unique design. "This summer I decided to focus on the colour. I wanted to bring richer appearance to my collection and add some fresh innovation as well. I created your favourite pieces with two different shades of a colour inside and outside to brings depth for the look and an opportunity to wear them reverse (inside out) according to your desire and mood." 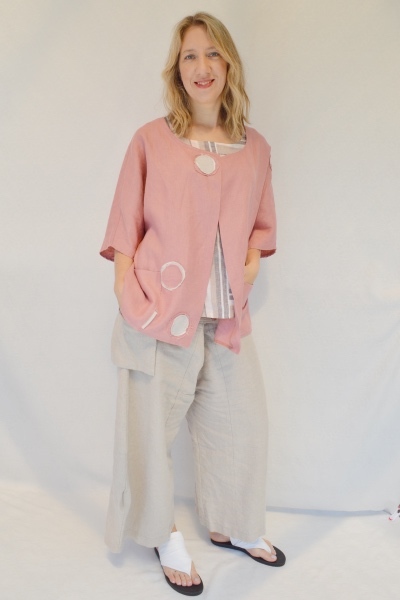 Funky linen pants look good with any knitted tops. "The leitmotif of the new styles is warmth and lightness of an angel’s hug. Do you know how an angel’s hug feels like? Well, me neither. But if I were to close my eyes and imagine it, I would feel comforting protection and warmth with distinguished lightness." Angel's Wrap is fluid and loose. It can be worn inside out or upside down. Each time it looks unique. It can be long - below the knees or short - just below the waist. It's the perfect choice to give an extra edge to your fall look. - Cotton and polyester blend. "The theme of my new collection is lacy knitting. I wanted to create something floaty and delicate; something that will resemble a breeze from the ocean during a hot summer day. I wanted to highlight the contrast between the solid fabric/material that falls loosely under its own weight and the breezy (transcendent) nature of beauty"
"This style is one of my favorites, wear it everywhere!" - O.G. Lacy Wrap is fluid and loose. It can be worn inside out or upside down. Each time it looks unique. It can be long - below the knees or short - just below the waist. This Mohair Wrap is light, warm and inviting to touch. It’s so comfy, you will wear it day-to-night! It is infinitely wearable, both for special occasions or for everyday life. In no situation will you find anyone who is more stylish than you! Transform your silhouette wearing this long, fluid dress with two pockets. The cool bamboo fabric will make you feel comfy and stylish. Wear it with a unique silk scarf or belt and enjoy long summer days and nights.